So sorry to have only now found out about this workshop – chine colle – do you have plans for another? 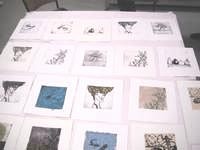 We love printmaking so we will be repeating that workshop although I can’t say exactly when. We will certainly note your interest and see about organising a workshop for the near future. My partner Kerry has done quite a lot of chine colle work of late and has honed her skills with this particular printmaking technique. I will put your email on our workshop alert email list so you can see when the chine colle workshop comes around as well as the other workshops we present.